My definition of a good fishing trip is one where I get home safely. 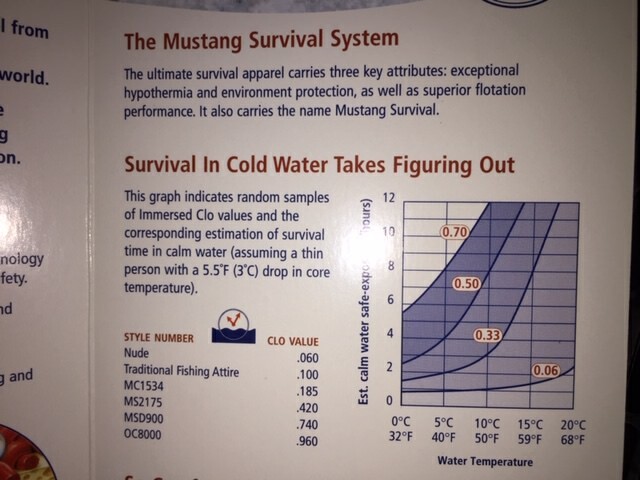 I started thinking about water temps in the 30's and decided to get a Mustang Survival Bomber Jacket to use when it is cold. I realize that wearing only the jacket and not the bibs isn't going to be as good as a full survival suit if I fall in but it should help. Has anyone taken an unexpected swim in the river when the water is cold? If you answer the question yes you obviously survived. How were you dressed and how long were you in the water? Twenty years ago (my early 50's) I was fond of wearing chest high waders and wading far out from shore. It was great and I caught a lot of smallmouth. This was winter wading some miles below a warm water discharge where the water didn't freeze but was usually in the high 30's or low 40's. One February I ventured out and found one of the slippery rock ledges that are so common in this section of the Susquehanna. I was wading alone. At that time I did not use a wading staff. I was not wearing a waist belt on the outside of the chest waders. My feet went out from under me and I went on my back in water that was just above my waist. The waders had air in them and my legs popped up like a balloon. I had no life vest on and my head wanted to go under. I couldn't get my feet on the floor of the river so I did the backstroke into shore. Seemed like an eternity. Lost my rod and reel. I was lucky I didn't loose my life. I was so exhausted...shivering and cold...I mean shivering. My heart was racing and I was breathing heavily. Not another soul around. I felt confused. It felt like I weighed an extra 50 pounds...everything was soaked and filled with water. I got back to the car and turned on the motor. I stripped every piece of clothing off...I wrapped in a blanket that I had in the car and prayed for the heater to warm up quickly. I never wore chest waders after that incident. I stay close to shore. I learned a very important lesson. That is a scary story. You are very fortunate to have survived. What is the purpose of the outside belt? Back in the mid 80’s I tried the opening trout day thing for a couple of years. One year I got hip boots to get away from the shoulder to shoulder bank scene. I couldn’t believe how cold my legs got from the spring water. With a safety belt cinched tight around the waist it is less difficult for water to find its way into the leg area of the waders. In my case...when I fell backwards into the water... the water ran into the chest high waders and partially filled both legs of the waders. If...and that is not going to happen in my case anymore...but if a person fished the cold Susquehanna in chest waders... I would recommend a staff, a belt cinched tight at the waist and either a kayak vest with foam flotation or a inflatable vest like Mustang Survival makes. It's a little scary to look back on some of the chances one took as a younger man. Got it. I have no intention of wading in the river. Back in the time frame I mentioned earlier I did some of that and I stepped into a few holes that could have been disastrous. I too have gained some sense as I have gotten older. Back to your ordeal can you gestimate how long you were in the water? Seemed like an eternity...but I immediately dropped my rod and started the backstroke with both arms until I got to the shoreline and was able to roll over on my knees in shallower water and push up with my arms. It probably wasn't more than a minute...but the combined effect of the anxiety, the physical exertion and the cold water was indeed stressful...could have been much worse. Wouldn't want it to happen now at age 73. The OC8000 looks like a space suit. It would appear that the jacket I got will buy me a little time but not much, at least from hypothermia. I am not unhappy with the purchase as it is going to be less bulky than a traditional jacket with a coat and more reliable than my inflatable. ...The OC8000 looks like a space suit. It would appear that the jacket I got will buy me a little time but not much, at least from hypothermia. 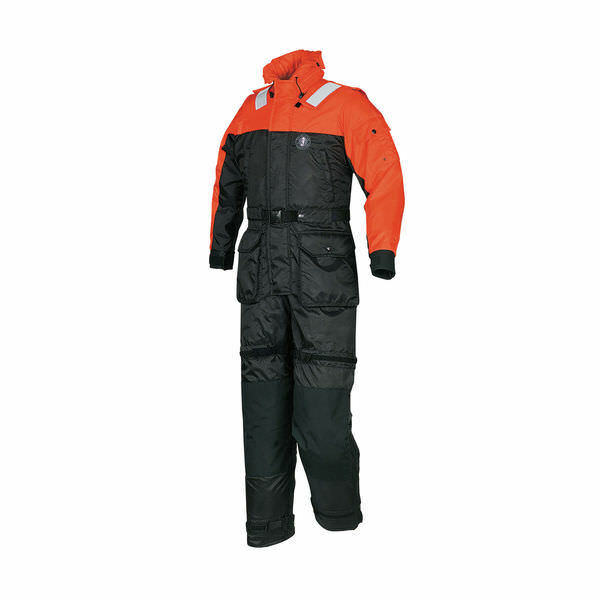 I am not unhappy with the purchase as it is going to be less bulky than a traditional jacket with a coat and more reliable than my inflatable. All my inflatable life jackets are from Mustang Survival...excellent company. They make a lot of cold water survival equipment. My experience wading was nothing compared to being out in a boat in winter and finding yourself overboard in 40 degree water... I never liked being out in the boat after Thanksgiving... I usually fish alone. But I did enjoy wading the warm water discharge while it lasted. In light of your potentially fatal dunking, I see irony in your " The hours spent fishing are not subtracted from the lives of men!!". Glad you survived, Bill. We all would have missed a lot of good reading if you hadn't.